Boots are the only ski equipment we wear. Trade shoes for boots when ready to ski. Like shoes, if you want to spend significant time active in your boots, fit is very important. 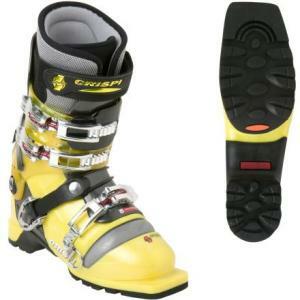 If you’re approaching wild snow from being a resort skier, then your alpine boots could be fine to start. Climbers who just want to approach climbs can use their climbing boots. Telemark skiing requires its own style of boot. Alpine touring (AT) and telemark boots are made to allow more comfortable walking and climbing than a traditional ski boot; they allow their user to lock the ankle for skiing and leave it flexible for climbing comfort. Sky climbs the last few steps to the summit of Mt Formidable. AT Boots range from featherweight racing models to burly freeride tanks that are as heavy as alpine boots. 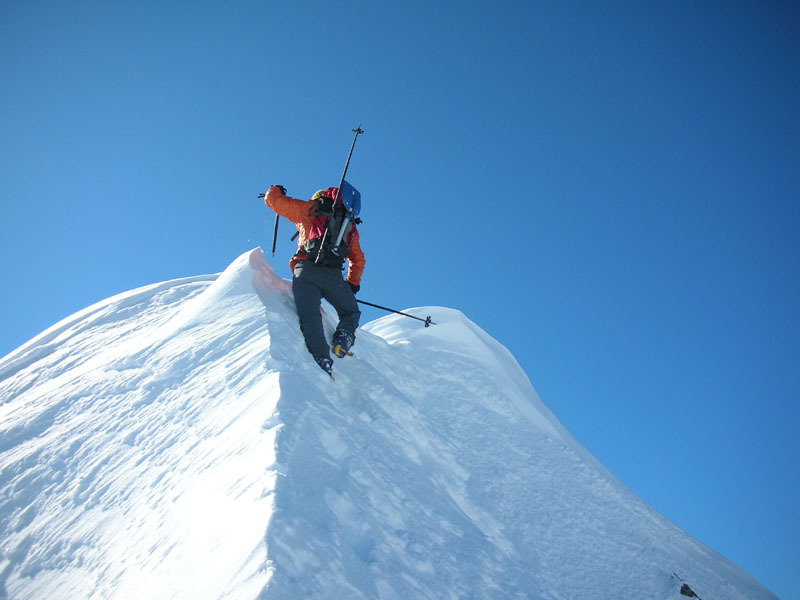 Beginning with Dynafit-compatible boots, Dynafit and Scarpa both offer ultralight models that are good for so-called ski mountaineering races (“rando rallies”), long tours with downhill skiing, and weight-conscious ski mountaineers. The Scarpa F1 has a shell with a flexing forefoot for hiking comfort, light weight, and a mechanism for quick transitions between walking and skiing. 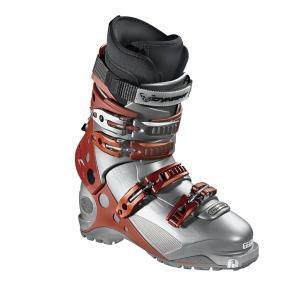 Dynafit makes a specialized race boot with only one buckle and a huge power strap that weighs less than three pounds, the Dynafit TLT 4 Race Pro TF. 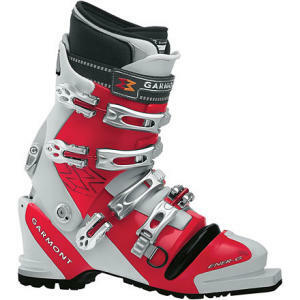 More performance-oriented Dynafit-compatible boots come from Dynafit, Scarpa, and Garmont. The Garmont Megarides have improved over several years to become the definitive four-buckle option with reasonably light weight. 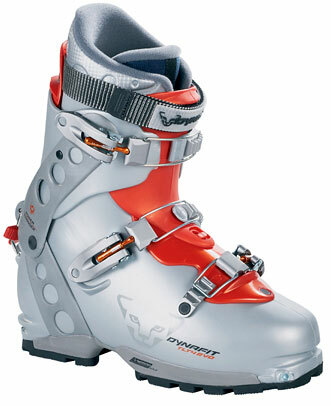 The Dynamite is Garmont’s three-buckle boot, offering slightly less weight and performance than the Megaride. Scarpa makes the Matrix as its performance Dynafit-compatible boot, which has been a reliable option for years; the new version is the Spirit 3. Dynafit offers their TLT Light (two-buckle) and Evolution(three-buckle) boots on the lighter side, which have the advantage of no step-in toe, which also makes the boots walk and climb much more like tennis shoes than any other . This also means that they’re not compatible with any non-Dynafit bindings. Recently, Dynafit began making the Aero boots for high performance, but they weigh more than the Scarpa and Garmont options; Dynafit will release more reasonable performance-oriented options soon. The heavy weight partially negates the Dynafit advantage, but those who demand a really stiff boot could get these and still save significant weight on bindings. Next year’s Dynafit Zzero series looks very promising; see http://www.doglotion.com/touring-boot-review-dynafit for a preview from Lee Lau. Buy AT and Tele Boots Now! Garmont Energy AT Boot On sale! Garmont MegaRide G-Fit AT Boot On sale! Lowa Stuktura AT Boot On sale! 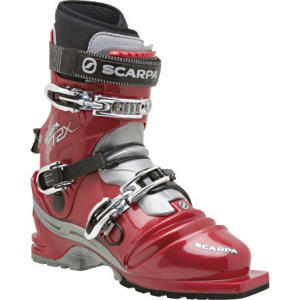 Scarpa T2X Telemark Boot On sale! All the Dynafit-compatible boots except the lighter Dynafit models will work with other bindings. The Garmont G-Ride offers the same lightweight four-buckle performance as the Megaride without Dynafit compatibility at significant savings. The Lowa Struktura and Struktura Light look like good compromises between performance and comfort. The Scarpa Denali is a long-standing high performance favorite. Finally, at the heavy end of the spectrum, the meta-touring club includes the Scarpa Tornado and Garmont Adrenaline and Endorphin. 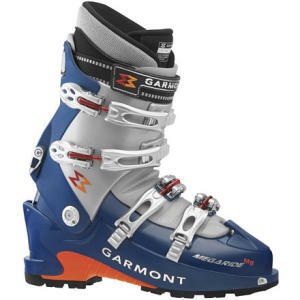 There are numerous telemark boots available from Garmont, Scarpa, and Crispi. Garmont offers the Ener-G for high performance and the Syner-G as a softer, lighter, more all-around boot. 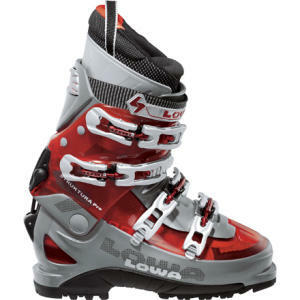 Scarpa offers a selection of boots that covers a spectrum of performance and weight, from the lighter T3s and T2s to the heavier T1s and super-burly T-Races. 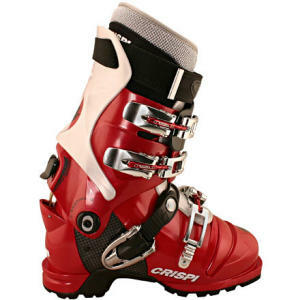 Crispi boots have a reputation for a softer flex, more like a traditional leather telemark boot. With a pair of boots, fit can not be overemphasized. Technique can compensate for performance, but nothing can compensate for severe damage to your feet. A new pair of liners can work wonders for an old pair of boots. New thermofit liners perform better and weigh less than old liners. Garmont, Scarpa, and Dynafit boots all come with thermofit liners now, which are also available separately. Intuition makes quality liners at a good value from Vancouver, BC. Superfeet or other custom orthotic inserts will make a difference during long tours and climbs. Finally, if inserts and thermofit liners don’t help, look for a boot fitter to modify your boot’s plastic shell, or try a different boot.